Home » Website Building » SEO » How to Add and Verify Site in Google Search Console? How to Add and Verify Site in Google Search Console? Google Search Console is the free tool offered for site owners to track the performance of their sites in Google search engine. Google’s single account login helps you to login to webmaster tools account with your Gmail id. Since all Google accounts are integrated, your Blogger and Google Sites will appear automatically once you logged inside Search Console account, you may need to set your sites visible to the search engines in Blogger or Google Sites account. For all other sites you need to add them to Search Console and verify that you are the owner of the site. In this article we will discuss step by step instructions on how to add and verify site in Google Search Console account. After Sign in to your Search Console account, click on the “Add A Property” button on the dashboard. Enter your site URL and click on “Continue” button. You will see various methods to verify your site ownership. Google recommends adding DNS text record and offers integrated verification process for a huge list of domain registrars. This method will work if you have an access to your DNS settings which means you should have a registered top level domain. Learn more about verifying site with GoDaddy registered domain. If you do not have access to your DNS or you do not have a top level domain then use one of the alternate methods offered by Google. One of the easiest way is adding HTML tag into your site’s header section by selecting “HTML tag” option. You don’t need to have an access to root directory of your site in this method. The verification code is displayed once you select the HTML tag radio button. Copy the verification code, paste it into the header section of your site and publish the site. 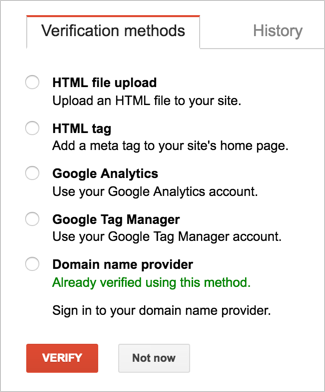 Click on the verify button in Search Console account and you will see the message for successful verification of your site ownership. If you do not see any data appearing for your site, then try adding both www and non-www versions of your site. They are considered as two different sites from Webmaster Tools perspective. You can delete your site from the Webmaster Tools account anytime later. The option for deletion is available under “Manage Property > Delete Property”. Adding or deleting site in Search Console account will not affect your site’s ranking in Google search results. It is only a tool to monitor and improve your site’s performance in Google search engine. If you already added Google Analytics tracking code then choose “Google Analytics” verification method to avoid adding additional code on your site.